Team Unknown Wins the Florida State BBQ Championship! You are here: Home / Competitions / Team Unknown Wins the Florida State BBQ Championship! 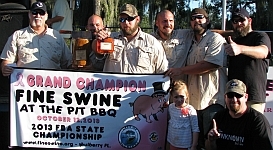 Team Unknown pulls out Grand Champion in the Florida State BBQ Championship that was held this past weekend. We won 18th in chicken, 8th in ribs, 2nd in pork and 1st in brisket. Our scores made it possible for us to win the championship. Forty eight (48) of the top teams in Florida competed in the contest. The contest, The Mulberry Fine Swine at the Pit, hosted their Tenth Annual BBQ Cook Off on October 11 & 12, 2013 at the American Legion Post 72 in Mulberry, Florida. They were chosen to be this year’s Florida Barbecue Association Florida State Championship.